In part 1 of our climate control series, we covered insulation options for shipping containers. We’re back this week with some basic considerations for ventilation and HVAC systems in conex containers modified for storage, mobile office and living space, container-based buildings, and industrial equipment enclosures. Your ventilation needs will depend on what you plan to store. All shipping containers come with small vents to equalize air pressure while traveling overseas, but these vents don’t create enough air flow to prevent mold or rust during long term storage. Pairs of passive vents installed in the shipping container walls can promote basic air flow without a power connection. The efficacy of these passive vents partly depends on the climate of the container’s location. For instance, if your container resides in a tropical climate, vents may not be adequate and therefore you will likely need to add an HVAC system to prevent mold. You’ve probably seen packaged terminal air conditioner (PTAC) units in hotel rooms. These reasonably sized units are ideal for single containers modified into storage, offices, and living spaces for a couple reasons. For one, they have the perfect amount of cooling power (15 K) to keep employees comfortable in a ground level office on a summer day. Second, their size hasn’t changed for decades. 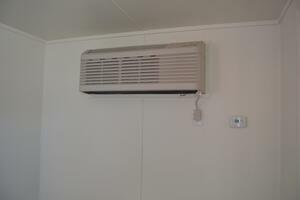 Installing an HVAC system in a shipping container means cutting and framing an equivalent sized hole in the steel walls. Should the PTAC malfunction, we’re confident it can be replaced without additional modifications to the container. While we love our PTAC units, there are some situations when a smaller through-the-wall unit (12 K) is the best solution. If you’re relying on solar power, a smaller unit that draws less power makes sense. The through the wall unit also doesn’t require a 220 V outlet; you can plug it into the same 110V outlet you’d use for a toaster. We also occasionally use them when wall space is limited. 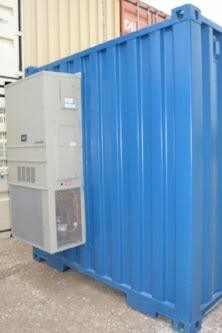 We recommend a more robust wall-mounted HVAC unit for container buildings and industrial equipment enclosures. Filtered air circulation makes permanent structures, like office buildings, a more pleasant work environment. If you’re protecting industrial equipment that emits heat or absolutely must stay within a set temperature range—for example, servers or water treatment equipment—choosing a heavy-duty HVAC system offers more peace of mind. While the climate control options discussed above have basic heating systems, they’re not very energy efficient when heating rather than cooling. 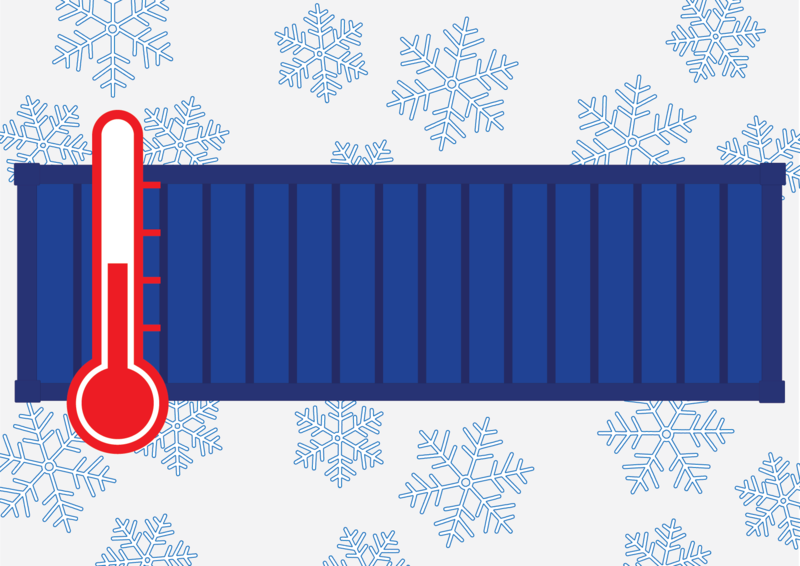 If you’re taking your container somewhere with below freezing temperatures, installing baseboard heaters is the best solution. We hope you found our two-part climate control series helpful. If you’re looking for a shipping container structure, check out our product line. All of our climate-controlled floor plans include field tested pairings of HVAC and insulation. If you have questions about climate control for a specific project, give us a call at 877-704-0177.